Israeli navy gunboats opened heavy machinegun fire at Palestinian fishing boats off the southern Gaza Strip coast of Khan Younis on Saturday morning. Nizar Ayyash, the head of the Palestinian fishing syndicate, told the PIC reporter that the Israeli gunboats opened heavy fire at the fishing boats while working in the permissible area. He said that gunboats fire at Palestinian fishermen on daily basis even if they were fishing in the three nautical miles radius allowed by the Israeli occupation authorities. The IOA had prohibited fishing beyond the three nautical miles area in violation of the calm agreement that allowed fishing within six nautical miles. The fishermen have complained of scarcity of fish over the past few months after they were banned from fishing at deeper waters. 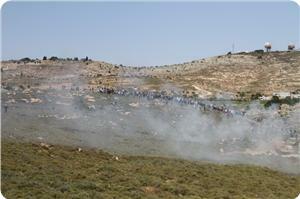 Israeli forces clashed with villagers south of Bethlehem on Saturday, a local committee said. The popular committee against the wall said Israeli forces fired tear gas canisters, rubber-coated steel bullets and stun grenades at villagers in al-Khader. The Israeli occupation forces (IOF) on Friday violently attacked a peaceful march demanding the Israeli regime to open a main road to the south of Al-Khalil city. Eyewitnesses told the Palestinian information center (PIC) reporter that a large number of Israeli troops were deployed near the southern entrance to Al-Khalil city, which has been closed for 13 years, and near Beit Haggai settlement. They said that these troops attacked Palestinian protestors rallying peacefully to condemn the closure of the road, and fired a hail of rubber bullets and tear gas at them. The events took place after a force of Israeli soldiers stormed Beit Ummar town and positioned at its entrances, according to a local source. The Hebrew radio, in turn, reported on Friday that Palestinian young men launched a Molotov cocktail attack on an Israeli military force in Aroub town to the north of Al-Khalil with no reported injuries. Violent clashes broke out on Friday between Israeli forces and Palestinian citizens, who came to perform Friday prayers in their fields threatened with confiscation near the town of Silwad to the east of the occupied city of Ramallah. Thousands of citizens from the towns of Silwad and Deir Jarir headed towards the lands located in the north of their hometowns and performed Friday prayers there. They have also tried to reach a hill controlled by the Jewish settlers, when the occupation forces started firing gas grenades and rubber bullets towards them. 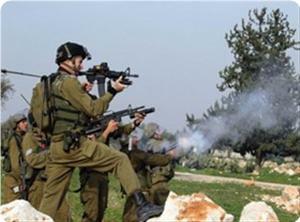 Eyewitnesses told PIC's correspondent in Ramallah that the Israeli soldiers have also used live ammunition against the citizens in an attempt to intimidate the owners of the agricultural lands and deter the demonstrators. Dozens of citizens suffered from suffocation, while medical teams could not reach the place because of its distance from the main street. The villages located in the east of Ramallah are witnessing a state of tension due to the settlers' continuous attacks on the villagers' farms. 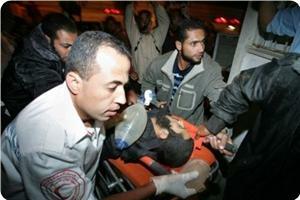 A Palestinian boy was wounded by Israeli fire on Friday evening in the east of Jabaliya, in the northern Gaza Strip. Dr. Ashraf al-Qidra, spokesman for the Ministry of Health, told PIC's correspondent that the occupation forces, stationed in the east of Jabalya, opened fire towards farmlands and residential neighborhoods, wounding a 17-year-old boy. Al-Qidra added that the wounded boy was taken to a local hospital where his condition was described as moderate. Four citizens have been killed and nearly 90 others have been injured in shooting incidents by the occupation forces, since the entry into force of the recent truce agreement signed in November last year. Israeli gunboats on Thursday opened fire toward Palestinian fishing boats off the coast of the Gaza Strip, a local official said. 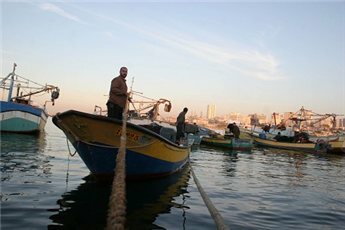 Israeli forces opened fire at the boats off north-west Gaza as the fishermen as approached the three-mile limit Israel imposes along the coastline, said Mahfouth Kabariti, head of a federation for fishermen and water sports. No injuries were reported, Kabariti told Ma'an. Israel's army announced in February that the fishing zone for Palestinians in Gaza would be reduced from six to three miles following a rocket attack. 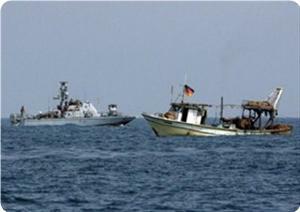 The Israeli occupation gunboats pounded at dawn Friday Palestinian fishing boats off the coast of the Gaza Strip. Sources in the Naval Police told PIC's correspondent that the Israeli gunboats have directly opened fire toward one of fishing boats off the coast of north-western areas of the Gaza Strip, causing material damage, but no injuries were reported. The sources stated that the occupation forces have also opened fire in the open sea off the coast of the Sudanea neighbourhood, in the western coast of Gaza City and in the coast of the central region. No casualties were reported. Israeli occupation forces (IOF) fired teargas canisters at two secondary schools in Abu Dis town to the east of occupied Jerusalem on Thursday. Jerusalemite sources said that dozens of students at Abu Dis school for boys and the other school for girls suffered breathing difficulty due to the IOF heavy firing of teargas bombs at them. They said that a 17-year-old boy was injured with a metal bullet in his foot while a little girl was treated for shock. The sources said that violent confrontations erupted in the vicinity of the two schools, adding that fire broke out in one of the nearby homes after IOF soldiers fired a teargas inside it igniting the fire. A 17-year-old student was injured Thursday when he was hit by a bullet in his foot during clashes with Israeli soldiers in the town of Abu Dis, east of Jerusalem, according to local sources. They told WAFA that Israeli soldiers fired tear gas canisters at schools in the area following a provocative visit to the town by an Israeli intelligence officer. 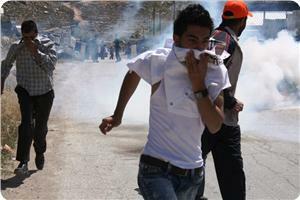 A number of students suffered from tear gas suffocation and the schools were quickly evacuated, said the sources. In addition to the foot injury, a female student was injured in the head when she fell while trying to run away from the clashes scene. Fire also broke out in one of the area homes after a tear gas canister fell inside it. Israeli police and undercover forces shot a Palestinian youth and detained three children, following a raid in the east Jerusalem town of Issawiyeh on Wednesday. The Information Center of Wadi Hilweh in Silwan said that the occupation forces raided Abid neighborhood in Issawiyeh and arrested three children aged 13, then took them to an unknown destination. An Israeli police spokeswoman said that the Palestinian young man started throwing stones towards the Israeli policemen and the border guards in the Issawiyeh neighborhood. The forces arrested only one man and fired into the air, according to the police spokeswoman claims. 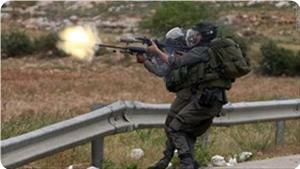 During the raid, 20-year-old Ibrahim Juweid was shot by the Israeli undercover units in the abdomen. He was taken to Hadassah Ein Karem Hospital were his injuries were described as serious. Member of the Follow-Up Committee, Muhammad Abul Humus, asserted that Juweid was injured by Israeli fire while he was attending his brother's wedding party in the town. Local sources said: "The elements of the Israeli undercover unit have randomly fired more than 50 live bullets in the area, injuring the young man and causing a state of panic among the villagers." Eyewitnesses said that the undercover unit has also arrested two other children and a young man from the West Bank during the raid in the Issawiyeh village. Hezbollah said Thursday it did not send a drone over Israel, hours after the Israeli air force said it shot down an unmanned aircraft off the country's northern coast. "Hezbollah denies sending any unmanned drone towards occupied Palestine," the movement's television channel al-Manar said, without elaborating. Israel's deputy defense minister earlier put the blame squarely on Hezbollah, which had said it was behind a previous drone infiltration on October 7. "An unmanned aircraft (UAV) was identified approaching the coast of Israel and was successfully intercepted by IAF aircraft five nautical miles off the coast of Haifa at approximately 2:00 p.m. today," the Israeli military said. Israel's Prime Minister Benjamin Netanyahu said: "I see this attempt to breach our borders as extremely grave. We will continue to do whatever we must to protect the security of Israel's citizens." Israel's deputy defense minister, Danny Danon, said it was clear that Hezbollah was behind the incident. 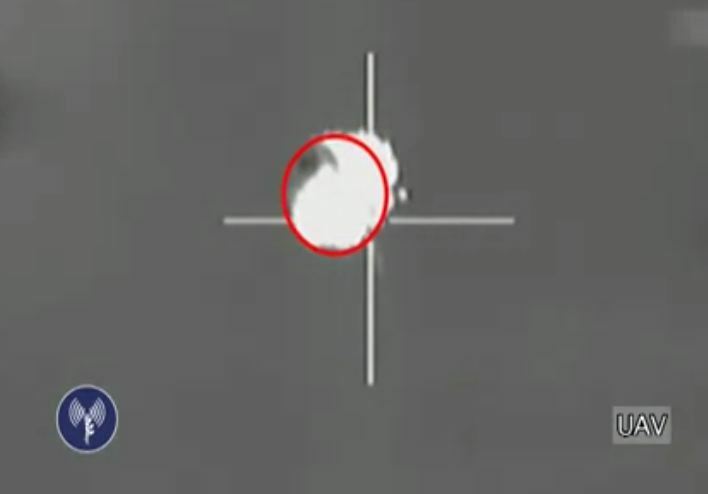 "We're talking about another attempt by Hezbollah to send an unmanned drone into Israeli territory," he told Israel's army radio, describing it as "another attempt to destabilize the Middle East." "We don't know where the aircraft was coming from and where it was actually going," he said, adding that the navy was "searching for the remains of the UAV." The Israeli military says it has shot down an unmanned aerial vehicle (UAV) belonging to Hezbollah near the northern port of Haifa. A military spokeswoman said the drone was detected in Lebanese skies and intercepted by an F-16 fighter jet on Thursday, some nine kilometers off Haifa’s western coastline, AP reported. A plane carrying Israeli Prime Minister Benjamin Netanyahu, who was visiting the Druze community in the north, was forced to land following the entrance of the drone into Israel. The Israeli navy is reportedly searching for the wreckage of the drone in the sea. Also last October, a UAV sent by Hezbollah flew deep into Israel before being downed by an Israeli missile. Israeli military sources that the Israeli Air Force intercepted and downed a drone believed to have been flown by Hezbollah party in southern Lebanon, and added that the drone was flying over the Haifa shore “trying to violate Israeli airspace”. The army issued a statement declaring that the drone was flying from the north heading to the south of the country, and that the army noticed it approximately at one in the afternoon before sending F-16 war jets to down it. The army said that the drone was relatively smaller than other drones, and that it was unclear whether it carried any weapons or explosives. It also said that the final target of the drone remains unknown, and that the army currently only knows that was heading to the south, were the Dimona Israeli Nuclear Reactor is located. In October of last year, Israel said that it downed a Hezbollah drone over the northern part of the Negev Desert. The army said that the drone did not carry any explosives. 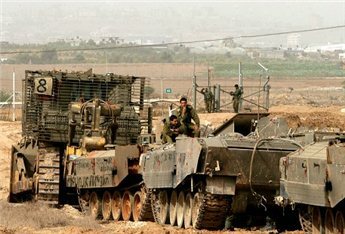 Thursday April 25, 2013; several armored Israeli military vehicles and bulldozers invaded an area east of Khan Younis, in the southern part of the Gaza Strip, and uprooted Palestinian farmlands before withdrawing. The Palestine News Network (PNN) reported that three military bulldozers and four tanks stationed in military camps across the border, advanced nearly 300 meters into Palestinian farmlands, uprooted the lands, and raised sand barriers while firing live ammunition at random. 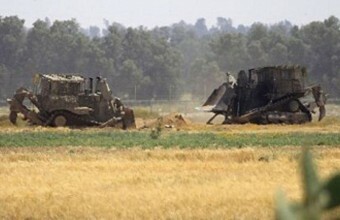 On Wednesday, the army invaded Beit Hanoun, in the northern part of the Gaza Strip, and uprooted Palestinian farmlands. The attacks are part of ongoing violations against the farmers trying to farm their lands close to the border fence in the coastal region. The army repeatedly opens fire at the farmers in an attempt to force them out of their lands; dozens of casualties have been reported. Israeli occupation forces (IOF) raided the eastern areas of Khan Younis, south of Gaza Strip, at dawn Thursday amidst intermittent firing. Local sources told the PIC reporter that four IOF tanks escorted three military bulldozers that advanced 300 meters in agricultural land to the east of Abbasan Al-Kabira while firing at random. The sources said that the bulldozers leveled land and erected sand barriers. 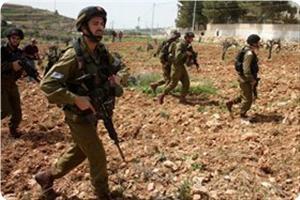 IOF troops on Wednesday advanced into northern Gaza Strip and leveled land near Beit Hanun town. All Israeli army infiltrations into Gaza Strip areas are in violation of the calm agreement concluded with Palestinian resistance factions in Cairo last November under Egyptian patronage. Two Palestinian minors were shot and wounded at the hands of the Israeli occupation forces (IOF) in Jalbon village near Jenin on Wednesday night. 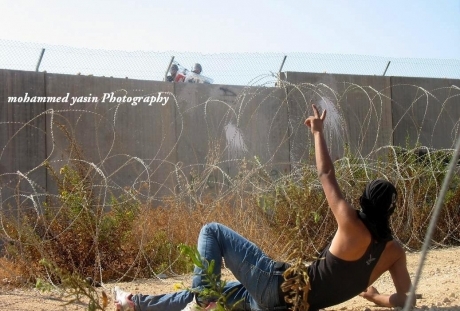 Eyewitnesses said that the soldiers fired at Yazid Tawfik, 16, and Ibrahim Omar, 17, at the pretext they approached the separation wall in the village and tried to cross it. They said that Yazid suffered bullet wounds while Ibrahim suffered serious fractures, adding that the soldiers arrested both and took them in an army jeep. The sources said that the soldiers combed the area and stormed Jalbon village, set a roadblock at its entrance, and searched passing vehicles. Israeli Military tanks and bulldozers on Wednesday penetrated Beit Hanoun from the Memorial Gate toward Palestinian fields in the northern Gaza strip. According to PIC reporter, 8 Israeli tanks and 4 bulldozers penetrated 300 meters east of the town, amid heavy fire from the Israeli military watchtowers toward Palestinian farmers. 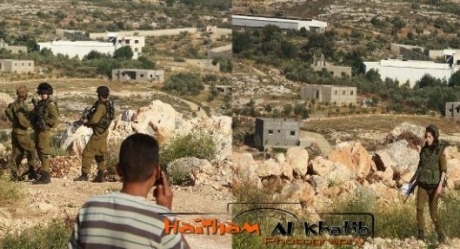 The reporter added that the Palestinian resistance confronted the Israeli incursion by firing a number of mortar shells. This recent incursion is considered the third Israeli breach in two days in flagrant violation of the truce signed between the IOA and Palestinian resistance under Egyptian auspices. Israeli Occupation Forces (IOF) raided at dawn on Wednesday the city of jenin and stormed a mosque, and conducted extensive combing operations. Local sources said that Israeli forces raided Halima al-Sa'diyeh Mosque in the eastern neighborhood in Jenin and searched it at dawn prayer, and then they took positions on the neighboring rooftops for hours. The forces also raided and searched the house of Abu Ghali family, where they investigated the family's members. IOF have also conducted combing operations in the nearby al-Almaneyya neighborhood at dawn. Meanwhile, IOF closed the entrances of Dura town south of al-Khalil and erected several checkpoints. The occupation soldiers were deployed throughout the district. The occupation forces closed Dura entrances and erected several military checkpoints in the western parts of Dura town, where they stopped the Palestinian vehicles and checked the citizens' identities, eyewitnesses told PIC reporter. 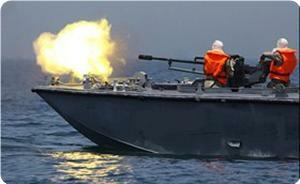 Israeli navy gunboats opened heavy machinegun fire at Palestinian fishing boats off the coast of Gaza city on Wednesday morning. Eyewitnesses told the PIC reporter that the Israeli gunboats fired at the fishing boats and in the air to scare the fishermen who were trying to fish within the three nautical miles radius fixed by the Israeli occupation authorities. Israel has been blocking Gaza sea route with the outside world since its occupation of the coastal enclave in 1967with only a few boats succeeding in entering the Strip. The Oslo accords allowed fishermen to work within the range of 20 nautical miles that was reduced by the IOA to 8 miles after the Aqsa intifada then to 3 miles after it tightened its blockade on the Strip six years ago. Undercover Israeli forces on Wednesday shot a Palestinian man and detained three others in a raid on Issawiya in East Jerusalem. 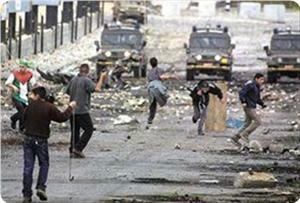 The forces raided a wedding party in the village, and local young men pelted them with stones, a Ma'an reporter said. Officers fired into the air, injuring 20-year-old Ibrahim Juweid in the abdomen. He was taken to Hadassah Hospital. 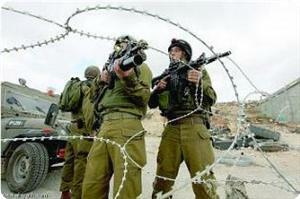 The Israeli forces also detained three young men. Issawiya is the hometown of Samer Issawi, who ended a 266-day hunger strike on Tuesday after Israel agreed to release him in eight months. Israeli forces have repeatedly raided the neighborhood amid frequent protests over Issawi's detention, dismantling a solidarity tent in the town over 30 times. 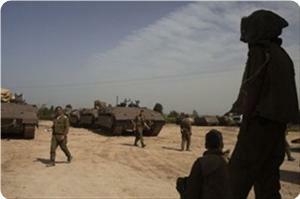 Israeli military forces entered an area in the northern Gaza Strip on Wednesday, locals said. Israeli bulldozers and tanks entered 300 meters into an area of land used for farming east of Beit Hanoun, witnesses said. An Israeli army spokeswoman said there was "routine activity adjacent to the security fence," without providing further details. Wednesday evening, April 24, 2013, dozens of Israeli soldiers invaded the Western Area of the Bil’in village, and took photos of the lands especially where a military monitoring tower was installed, and was removed two years ago after the Annexation Wall was rerouted following an Israeli Court ruling. Local sources reported that the army carried camera, maps and equipment and took photographs in the area where the military watchtower was removed on June 27, 2011. The Popular Committee Against the Wall in Bil’in reported that a local villager was in the area, and asked the soldiers about what they were doing but they ordered to him leave. The ongoing nonviolent resistance against the Wall and settlements in the village managed to force Israel to return Palestinians lands following eight years of ongoing struggle against the ongoing Israeli violations, mainly the construction of the Wall and expansion of illegal settlements. Bil’in became a role model for popular struggle against the occupation, the Wall and settlement, and became the target of constant Israeli military assaults targeting the residents and their Israeli and international supporters.